This article looks at the phenomenon of legal citation and its unintended consequences. 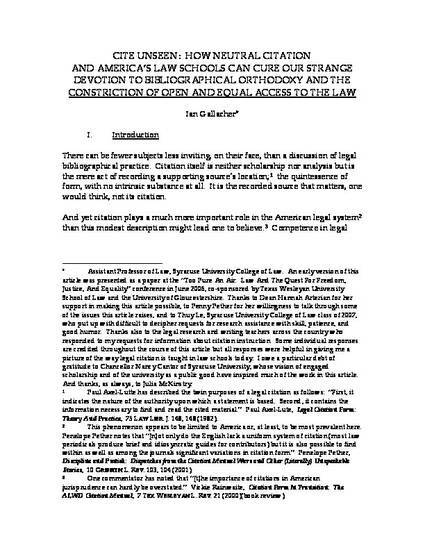 After considering the reasons for the American legal system's devotion to precisely accurate and detailed citations and the history of American legal citation, the article looks at the effect the bibliographical orthodoxy promoted by the two leading citation manuals – The Bluebook and the ALWD Manual – has on open access to the law. In particular, the article looks at how the required common law citation format prescribed by both of these manuals helps to consolidate the market position of West and LexisNexis, the duopoly of legal publishing in this country. After considering the inadequacy of some present-day open access legal information sites, and exploring why it is that market pressures make it unlikely that a viable commercial competitor to the West/Lexis duopoly will emerge, the article concludes that the best approach to ensuring that the law remain free and open to all is through the use of a neutral citation format to describe case law and the formation of a consortium of American law schools to publish the law on the internet.